On January 19th, 2018, The Department of Health issued a statement announcing the HSE’s decision to approve reimbursement of the Abbott Freestyle Libre for Children and Young Adults with type 1 diabetes excluding all adults with type 1 diabetes. (What is the Freestyle Libre? See here). Read my initial reaction here. And a summary of the latest in the campaign here. On Wednesday 22nd June 2016 Diabetes Ireland, People with Diabetes and our National Clinical Leads in Diabetes Strategy briefed TD’s and Senators on the need for extra resources to improve the diabetes service for the 225,000 people living with the condition in Ireland today. I was part of that delegation and you can read more about it here. On the way home in the car, as Rebecca drove, I was interviewed by ClareFM's Morning Focus. Listen in here. 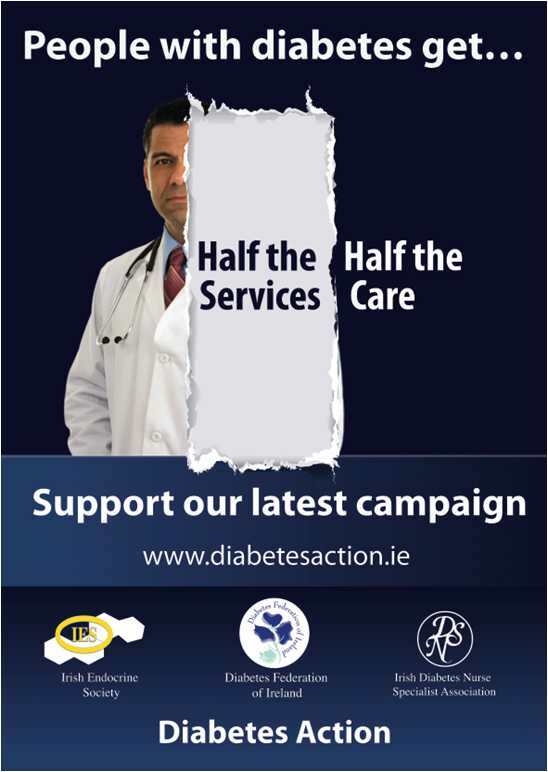 In 2010, Diabetes Ireland launched Diabetes Action to push for national diabetes policies to be implemented in the health service. The first campaign in this three year roadmap was to implement the National Diabetic Foot Model of Care.